It was hard to find an image that demonstrates the principle of ‘efficient energy planning’! 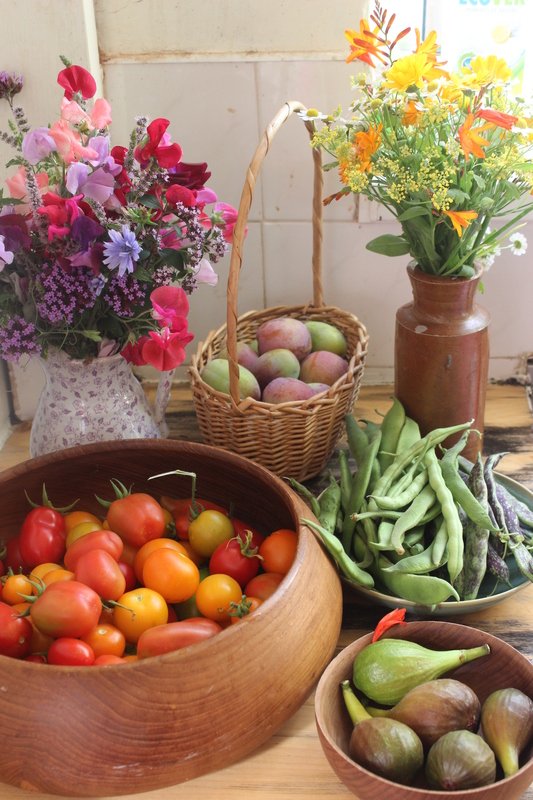 I finally settled on this one, of the abundant fresh produce harvested from my garden one day in August, and here is why… Years ago we used to have an allotment. It was about a mile from our house, so we used to walk or cycle there which took 30 mins at least. We began by spending whole weekends tending our plot. After a while we started renovating our house and this squeezed our available time to devote to the allotment. A few more years passed and we had our first child, by this point our free time to spend on the plot was minimal and by the time we had travelled there our daughter was fed up of being in her pushchair and needing our attention. So the allotment got more and more neglected and eventually we gave it up. Soon after that we moved house to our current home with a huge south-facing garden. We now grow our fruit and veg in the garden, so we have only to step outside the back door to tend to our plants. We now have three children so there would be no way we could make the two mile round trip and devote the time required to the upkeep of an allotment, but by growing our food where we spend all our time, the garden gets attention little and often, And the results are wonderful! This demonstrates the importance of efficient energy planning in terms of Zoning, placing items used most often, closest to your home. The purpose of this is to minimise wasted energy in your system. 1. Putting items needing to go upstairs into a basket placed on the bottom step and carrying them all up in one go at the end of the day rather than making multiple trips up and down the stairs throughout the day. 2. Storing water close to where it is needed, ideally at the top elevation of your site so that it can be moved with minimal effort using gravity. 3. Planting your herbs just outside the backdoor, so you can easily grab a handful while cooking dinner, ideally without even needing to put on your shoes! I knew that this month would be a hectic one for me, as I am embarking on a number of different training courses and projects that are demanding of my time. So in order to efficiently plan my energy, I decided to get a leg-up on this challenge by completing it a few weeks ago. 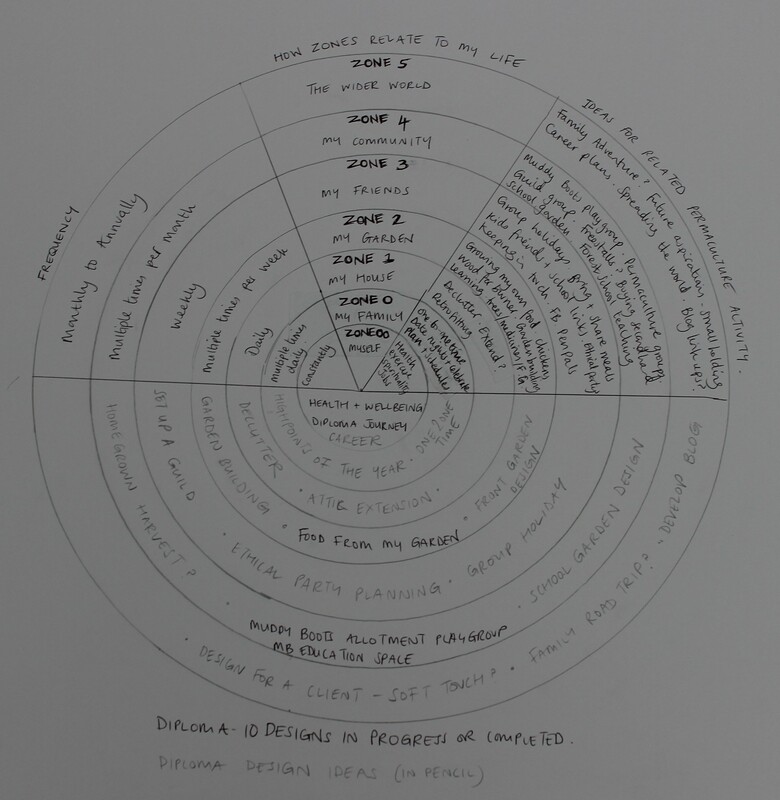 I wanted to look at my Permaculture Diploma in terms of Zoning and ensure that I had a good handle on what my diploma designs were going to be and how they fitted into the zones of my life. The diagram below shows zones in my life and ideas for related designs slotted into the relevant zone. This can help me decide which designs to prioritise by indicating how closely they are related to the centre of my life, my Zone 00. This entry was posted in Uncategorized and tagged Bill Mollison, Efficient energy planning, Looby Macnamara, Mollison principles, Permaculture, Permaculture Diploma, Twelve principles for twelve months, ZONES by emilycrofton. Bookmark the permalink. Hi Emily, this is brilliant! Would you mind if I show my PDC students your ‘Life Zoning’ exercise? It’s such a nice example of non-land-based zoning!